Drop-dead gorgeous Shakira wowed fans with an energetic performance at the Singapore Formula One Grand Prix concert on Saturday night. Performing between the final F1 practice round and the first round qualifiers, the Colombian beauty treated fans to a diverse repertoire. Popular hits like "Wherever, Whenever", "Hips Don't Lie", "She Wolf" from her latest album like, a number of Spanish hits and even a cover of Metallica's "Nothing Else Matters" drew over 10,000 people to the Padang. The 34-year-old hip-shaking siren, who was performing in her maiden gig in Singapore, also showed that her talents don't just lie in her sultry dance routines. In the middle of the concert, she rocked out with the guitar and harmonica on stage before performing a flirtatious dance routine during an acoustic segment that drew a thunderous applause and cheers from the crowd. The songstress, who's dating footballer Gerard Piqué of Barcelona, also knew how to reach out to her fans when she invited four lucky girls from the crowd up on stage to dance and sing with her. Making themselves heard throughout the concert, the crowd saved their loudest cheers for her World Cup 2010 hit, "Waka Waka", which was only performed during the encore. Projects executive, Jaslyn Loh, 22, who almost lost her voice screaming, told Yahoo! Singapore, "I came at 5pm to get a place near the front for Shakira's concert and it was well worth it and every penny I paid. I definitely will go for her concert gain if she comes back." 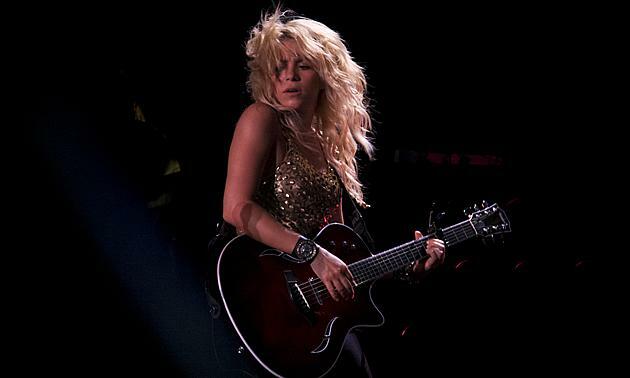 Die-hard Shakira fan, Mazlina, 21, an undergraduate, added, "I'm really delighted with Shakira's performance. It was good that she made the effort to interact with the crowd and she really looked like she gave it her all." Another fan, Roger Lee, 34, was even more envious of the person Shakira is currently dating. "She's really hot and really beautiful. Gerard Piqué's a lucky man," he said. Formula One frontrunner Sebastian Vettel secured pole position at the Singapore Grand Prix, giving his team, Red Bull, their 14th pole position in as many races. The defending champion lapped the Marina Bay Circuit in one minute 44.381 seconds to edge out team mate Mark Webber by 0.351 seconds. Jenson Button will start third on the grid, qualifying with a time of one minute 44.804 seconds. The pole position is Red Bull's 15th on the trot, dating back to the final race of last season at Abu Dhabi.